The plot of this work of fiction was pedantic. 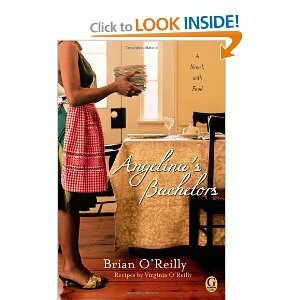 Within weeks of her husband's death a neighborhood bachelor arrives unexpectedly and unannounced on Angelina's doorstep with the proposition that she cook breakfast and dinner for him. Within days, her clientèle reaches six – two of which are age appropriate matches for the newly widowed cook. After the city threatens to shut down her unlicensed dining establishment Angelina opens an immediate and widely successful restaurant. In an entirely expected plot twist which, of course, results in a happy ending for all, Angelina begins dating one of the available bachelors. However contrived the main plot points are this novel is not without merit. There are a few vivid descriptions of food that make the novel worth reading. The most memorable of which begins the novel. The explanation of the main character's motivation behind cooking (also in the first chapter) offered insight into her character and made her easy to relate to. Unfortunately, the rest of the character's were not highly developed. It was difficult to keep the ever expanding list of male character's distinct. Recipes are included throughout the text of the novel, this interrupts and disjoints the action of the novel itself. Overall, this is a nice, light beach read but offers little of substance to the reader.